This article is based on one of the verses of the Niti-sataka of Bhartrhari, the ancient king and poet who renounced the world and led an ascetic life. The collected work of Bhartrhari is known as satakatraya consisting of three thematic compilations on Srngara (passionate love), vairagya (renunciation) and niti (moral conduct) of hundred verses each. We hope to bring out more such articles in the future issues of BTG. 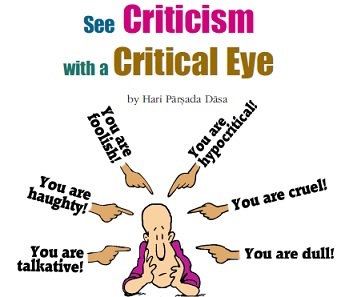 Criticism is among the most powerful influencers in our life. It can guide us to become better, but it can also wound our will to become better. When we receive criticism delivered insensitively or immoderately, it can damage our foundational sense of selfworth. If that sense is destroyed, we lose the confidence and the will to improve, just as a building collapses when its foundation is destroyed. Even when people criticize us for faults we actually have, still it can demoralize us. What then to speak when people criticize us for faults we don’t have. And critics sometimes indulge in such unjustified criticism by giving a negative spin to our good qualities. The Bhagavad-gita (18.28) states that expertise in insulting others characterizes those working in the lowest mode of ignorance. Illustrating such perverse expertise, this verse from Bhartrhari, one of the greatest Sanskrit grammarians in Indian history, gives several examples of how critics perceive good qualities negatively. Jadyam hrimati (The gentle are called dull): Gentleness is a virtue, but habitual critics deride it as lethargy that prevents people from being assertive. Srimad- Bhagavatam, Canto One, describes how the gentle sage Sukadeva Gosvami wandered about through towns and villages in a spiritual trance, indifferent to his surroundings. Not understanding his transcendental absorption, common people pursued him till he entered an assembly of sages. When that illustrious assembly offered him a seat of honor, they shrank back in surprise. Vrata-rucau dambhah (The strict are called pretentious): Strictness in honoring one’s vows is laudable, but critics deride it as pretentiousness, wherein one wants to attract adulation and praise. Srimad-Bhagavatam, Canto Eleven, narrates the story of a brahmana from a place called Avanti referred eponymously as the Avanti brahmana. He had led a distressingly miserly life, but had lost everything in a chain of adversities. That misfortune had inspired within him realization and renunciation. 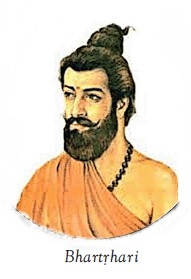 Resolving to focus on spiritual reality, he had taken a vow of silence (maunavrata). But common people, being obsessed with his past stinginess, refused to acknowledge his spiritually evolved state and its concomitant firm determination. They derided his avowed silence to be like that of a crane. According to a traditional parable, a crane that couldn’t catch fish pretended to be a renouncer and stood motionless on the banks of a body of water. When some fish, laying down their guard, came near it, the crane immediately devoured them. Sucau kaitavam (The honest are called hypocritical): Leading a pure principle-centered life is laudable, but critics label it as hypocrisy, insinuating that the virtuous person is concealing a deficiency beneath an apparent adherence to principles. In the Mahabharata (Sabha Parva), when the Rajasuya sacrifice was being performed, the demoniac Sisupala was incensed that Krsna was accorded the position of the most exalted person in the assembly. In his fury, he lashed out at all those who had advocated Krsna’s candidacy. The most influential among those advocates was the venerable grandsire of the Kuru dynasty, Bhisma. Sisupala accused Bhisma, a lifelong celibate, of having adopted renunciation just to conceal his impotency. The accusation was malicious and outrageous – Bhisma despite having grand-nephews who were in their manhood was still an embodiment of virility, being able to best the best of warriors. Sure nirghrnata (The brave are called cruel): Valor in overcoming despots is glorious, but critics, acting as blinkered peaceniks, condemn such valor as cruelty. When Krsna, despite being a teenage boy, killed the tyrannical demon Kamsa after overpowering an array of murderous wrestlers, his achievement was stupendously heroic. But the demon Jarasandha, a relative of Kamsa, saw his action as cruel. He labeled Krsna as the killer of his own maternal uncle. Jarasandha conveniently neglected the reality that Kamsa had not once acted affectionately towards Krsna, as behooved a maternal uncle. He had killed Krsna’s six brothers, arrested his parents and had sent several demons to murder him. Surviving all these attacks, Krsna had heroically turned the tables on Kamsa. Labeling such heroism as barbarism was an insult to the truth. Munau vimatita (The reticent are called foolish): Choosing one’s words carefully and speaking sparingly is a good quality, but such reticence is often criticized as foolishness. Srimad-Bhagavatam, Canto Five, describes the story of the great sage Jada Bharata, who habitually remained silent to avoid getting entangled with materialistic people. When he was conscripted into carrying the palanquin of the king Rahugana, he still maintained his silence. The king seeing his unresponsiveness thought him an ignorant fool. When the sage, not wanting to step on ants, walked haltingly and the palanquin was jolted by his jerky movements, the king castigated him. Only when Jada Bharata opened his mouth and spoke profound philosophy did the king realize that he had been hugely mistaken in his assessment of that sage. Dainyam priyalapini (The soft-spoken are called fawners): When considerate people, desiring to avoid confrontation, speak conciliatorily, critics see such overtures as expressions of powerlessness. The Mahabharata (Udyoga Parva), describes how Krsna acted as a peace envoy on behalf of the Pandavas. He went to the Kauravas to offer them peace on the most accommodating terms. But the Kaurava prince Duryodhana saw Krsna’s sweet words of conciliation as signs of weakness and became increasingly adamant and arrogant till finally he tried to arrest Krsna. Of course, Krsna was more than equal to such tricks – he foiled Duryodhana’s plan by exhibiting his insuperable universal form. Tejasviny avaliptata (The influential are called haughty): Some people are celebrated because they are talented and dedicated – they have earned their laurels. But instead of giving credit where it is due, critics condemn such luminaries as showoffs. The Ramayana (Yuddha Kanda), describes how Rama accepted as his ally Ravana brother, Vibhisana. To seal their alliance, Rama, using seawater, coronated Vibhisana as the king of Lanka, which was then ruled by Ravana. Instead of seeing the coronation as a warning of things to come, the proud Ravana mocked it as a haughty show by Rama, dismissing it as one pauper installing another pauper as a king. He conveniently neglected the facts: This so-called pauper had single-handedly annihilated his fourteen-thousand-strong demon army led by some of his most formidable commanders; and this pauper’s one monkeymessenger had single-handedly burnt half of Lanka. Mukharata vaktari (The eloquent are called talkative): Some people can speak fluently and brilliantly, but critics deride them as egotists. Srimad- Bhagavatam, Canto Ten, describes how Indra, the head of the gods, labeled Krsna as talkative when he eruditely instructed the residents of Vrindavan to stop worshiping Indra and instead worship Govardhana Hill. Asaktih sthire (The steady are called unambitious): People who are steady and content are deemed powerless and ambition-less by critics. Srimad-Bhagavatam, Canto Five, describes the narrative of king rsabhadeva who in the later stages of his life renounced his kingdom and lived in utter penury, not even attending to basic bodily needs. Some people mistook him to be good-fornothing, not knowing that just a short while ago he had competently ruled a huge kingdom. How critics spare no one is conveyed in this verse by stating that people at both ends of the spectrum are criticized. Those who talk less are criticized, as are those who talk more. Those who are conciliatory are criticized, as are those who are assertive. Those who are content are criticized, as are those who are enterprising. The verse therefore concludes with the rhetorical question: What quality hasn’t been panned by critics? While dealing with such unsparing, unreasonable critics, we need to know that people don’t see the world as it is; they see it as they are. Based on their natures, some people get along with others and some don’t – that’s just the way people are. Accordingly, some people may not like us, no matter what we do. Such people will see negatively even the good we do. The only way to deal with them, as implied in the verse’s rhetorical conclusion, is to neglect them. And while we are discussing how to deal with cynics, we need to be aware that one such cynic resides inside us too. That is, we ourselves may, based on our nature, find certain behaviors among others intolerable and criticize them unwarrantedly. The Gita (16.2) cautions us against pandering to this inner cynic by reminding us that the godly are characterized by an aversion to faultfinding. Returning to our discussion about outer cynics, neglecting them entirely is difficult because we are social beings. We need a supportive circle that encourages and appreciates us. Our social need remains even when we start practicing spiritual life. Materialists are usually critical of spiritualists. So, if we are to persevere on the devotional path, we need the association of devotees. When we get a sense of belonging in devotee circle, we can develop the necessary thick skin to endure the inevitable criticisms of materialists. Soberingly, however, not all devotee association will thicken our skin – some may tear it. Srila Rupa Gosvami in the Bhaktirasamrta- sindhu (1.2.228) states that we need to associate with like-minded devotees, or more specifically with devotees who have the same purpose as us (sajatiyasaya- snigdha-Sri bhagavadbhakta- sangah). Put in contemporary idiom, we need the association of devotees who share our definitions of success. If we feel inspired to study scripture deeply but are surrounded by devotees who are inspired to build a temple for Krsna, we will find ourselves covertly and overtly criticized for not having a service attitude, for being over-intellectual jïanis who don’t do anything practical for Krsna. Conversely, if we feel inspired to build a temple for Krsna but are surrounded by devotees inspired to study scripture, we may find ourselves criticized for having no appreciation for scripture, for thinking more of the structure of the temple than the one who resides at its heart. These examples are probably extremes, but they illustrate what can happen when neophyte devotees see bhakti only in terms of their particular definitions of success. Srimad- Bhagavatam (11.2.47: na tad bhaktesu canyesu) indicates that neophyte devotees consider only devotees belonging to their group as successful. Bhakti is so inclusive that it allows us to serve Krsna in various ways, thus accommodating multiple definitions of success. In fact, it doesn’t just accommodate multiple definitions; it endorses them. The Gita (18.46) urges us to worship Krsna through our own work, and then (18.47) insists that serving according to our own nature is far better than serving according to another’s nature. Despite bhakti’s inclusiveness, neophyte devotees sometimes hold that their definition of success in devotion is the only definition of success. Claiming that one’s way is the only way is the doorway to fanaticism. To steer clear of such fanaticism, we need to recognize that amidst differences in the practice of devotion, the pertinent question is not what is right or wrong, but what is right for me. To understand what definition of devotional success is right for us, we need guidance and introspection: guidance of our venerable spiritual mentors, and introspection for understanding our nature. And once we have dedicated ourselves to pursuing a particular form of devotional service, to sustain our commitment, we absolutely need the association of like-minded devotees. In such association, both encouragement and criticism spur us to improve. Encouragement inspires us to move ahead faster, and criticism inspires us to do the necessary course correction. When we feel accepted, valued and loved by our spiritual friends and guides, then criticism coming from them, far from disheartening us, inspires us to improve. And criticism is sometimes necessary. Even Bhatrhari’s examples of criticism can be true. That is, some aggressive people may be cruel, for example. But he refers here to unjustified critics or cynics. Far different from such cynicism is constructive criticism. The bhakti tradition compares the cutting words of sages to a surgeon’s scalpel. Just as the scalpel cuts off unhealthy tissue, so too do the corrective words of our trustworthy spiritual guides destroy our misconceptions. Just as avoiding surgery can worsen the disease, so too fleeing from corrections can aggravate our illusions. Therefore, when we get constructive criticism from our well-wishing mentors, we need to humbly and honestly introspect and improve. At the same time, the mentors too have the responsibility to offer criticism judiciously. For the scalpel to heal, it needs to be operated by an expert – and be expertly operated. Just because one is a surgeon doesn’t mean that any cut one does in any way will be therapeutic. Similarly, for criticism to do good, it needs to be offered by spiritual experts who accurately perceive the problem and the solution. And they need to deliver it sensitively so that those corrected feel valued and encouraged, not devalued and disheartened. The biggest danger from criticism is that it may extinguish our inner fire, our drive to do something worthwhile in Krsna’s service. When criticism starts extinguishing our devotional desire, we need to step away from its source physically and turn away from it emotionally. Ultimately, to sustain our devotion amidst criticism, we need to connect spiritually with the one who has given us our gifts and for whom we are striving to develop them. Our relationship with Krsna established through prayer, meditation and worship provides us an inner sanctuary beyond the reach of critics. By finding affirmation and inspiration in his loving remembrance, we access inexhaustible inner empowerment for persevering despite the world’s criticism.